In rural areas from the 1900s to the 1940s, teachers either lodged with local families or, if the community could afford it, in a teacherage. 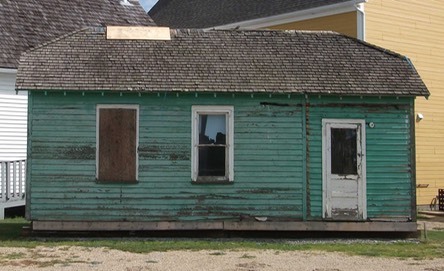 Teacherages were very small houses, usually two, sometimes three, rooms and were placed next to the school. These buildings did not normally survive intact and were often burnt down, or sold to a nearby farmer for a shed, so there are not very many existing. 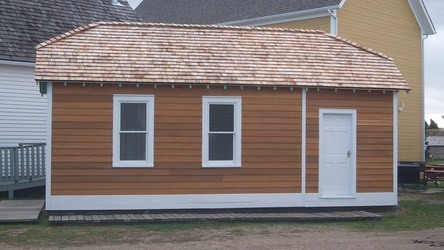 This example is believed to be from the Village of Wabamun and was later moved to a farm yard in Darwel. It was donated to the Museum by the Kosik family and Kosik Construction. Because it has been relatively unchanged since it was first built, it is a really wonderful find for the Museum and we are still researching its history. We hope to determine the exact age and construction, and as much information as possible about the building. We invite and ask anyone who has any photographs or information about the Wabamun Teacherage to contact us to help with this wonderful project.